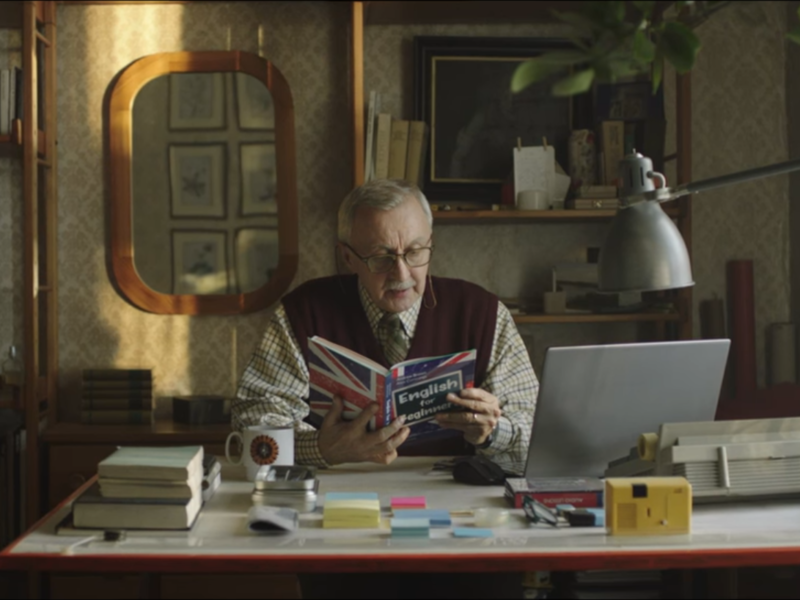 In This Polish Christmas Advertisement, Allegro Draws Out The Happy Tears : The Two-Way The sweet little story of an aging man learning the English language features a kid, a puppy — and a hopeful take on a journey made by hundreds of thousands of Poles. The English lessons begin in this ad from Polish online online auction platform Allegro. The holiday competition to warm the cold cockles of our hearts is sure heating up. Last month, weeks even before Thanksgiving, British retailer John Lewis loosed the first volley with its annual Christmas ad. The long, cinematic commercial had nearly everything: a cute kid, an ambitious dog (named Buster) — and a dash of humor to thread them together. Put A Little Bounce In Your Day With A New Christmas Ad From The U.K.
Now, that powerhouse ad finally has a worthy rival — from Poland. Since Allegro, a Polish online online auction platform, posted its 3-minute-long advertisement to YouTube, the video has been viewed nearly 4.5 million times (and counting). It's mushy, sure, and likely to generate some happy tears. But there's a kernel of difficult truth in this holiday tale. "Many Polish people share the same experience" as this grandfather and his son, an Allegro spokesperson tells BuzzFeed News. "Nearly one million Poles have decided to leave the country in search for a job, mainly heading [to] the United Kingdom. Despite the relatively close distance between the countries, family ties tend to weaken." Just last year, Poland passed India as the most common country of origin for immigrants living in the U.K., according to a BBC report citing the Office for National Statistics. Since the U.K. joined the European Union in 2004, the number of Polish-born residents there has increased by some 750,000, to more than 830,000. Many of those Polish immigrants have found themselves feeling uncertain about whether they'll be able to stay in the U.K., as immigration policies might change. And as The Washington Post reports, Polish communities there have increasingly found themselves the victims of anti-immigrant discrimination in the wake of the referendum. "Christmas for many is a difficult time in which we yearn for more. But the story we are telling is all-purpose and can be easily understood by any other nation or community who can easily link the happy ending of a smile and tears of emotion to their daily human experience." Plus, let us remind you: It's got a puppy.